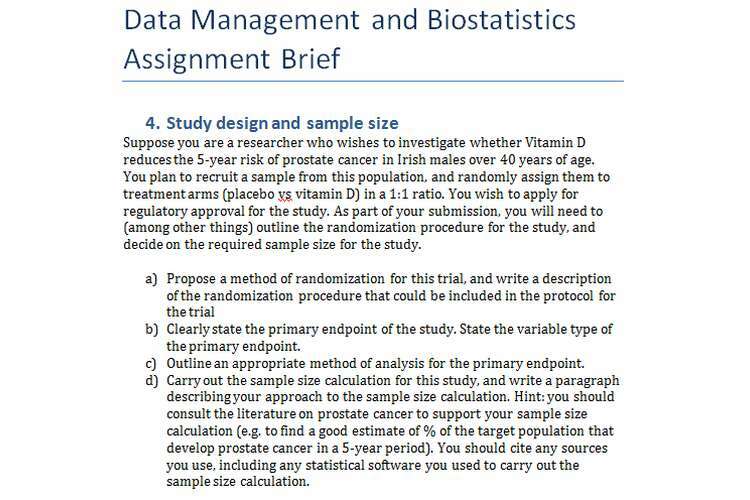 The dataset for this data management and biostatistics assignment brief can be found in the Excel file prostate_cancer_dataset.xlsx (on Blackboard). The Excel file contains two sheets; the first sheet (‘DATASET’) contains the dataset you will need to complete this assignment, and the second sheet (‘CODEBOOK’) contains a description of each variable in the dataset. This data was collected as part of a randomized controlled trial to assess the effect of treatment with diethylstilbestrol (or DES, a synthetic non-steroidal estrogen) on survival in stage 3 and stage 4 prostate cancer patients. Several baseline characteristics were measured, including stage of prostate cancer, age at diagnosis, weight index, performance rating(a measure of quality of life), whether patient had a history of cardiac disease, systolic and diastolic blood pressure, electrocardiogram result, serum hemoglobin, size of primary tumor, a combined index of stage and histological grade, and whether or not bone metastases had occurred. Each patient was followed-up and survival status and survival time (in months) were measured. A. Import the dataset to SPSS. Define the attributes of variables in the dataset (in the ‘Data View’ in SPSS). Note, you will be assessed on whether or not you correctly define variable attributes. Note: you should present the results all in one table. If you are unsure how to present the data, look up some published clinical trials to determine how baseline characteristics are usually presented.Provide a brief discussion on whether the baseline characteristics appear to be balanced across treatment arms. 1. How many, and what percentage, of men in the sample are aged >75? Show how you obtained the answer to this question. A. Test the hypothesis that the proportion of survivors differs for patients treated with estrogen (combining those on doses 0.2, 1.0 or 5.0 mg) compared to those not treated with estrogen (placebo),using the 7 step process for hypothesis testing. Patients will be stratified based on severity of disease. Patients will be treated for 3 months, with a final follow up visits at 3 months after last treatment.